Construction workers dig deep to bring the Drinking Water Project online. Two roiling basins of water press against each other, divided by a two-story-high concrete wall. One side is a gurgling brown mess of chemical dust—it looks like mud soup. But the other side glistens, clear as glass, tempting a dip of the hand. The water is connected. The brown goo looks the way it does due to ferric (iron) chloride, which is mixed with the water to act as a kinetic coagulant, smashing into and grabbing hold of stray non-H20 particles. The water then filters at the bottom of the wall through a “weir” (a dam-like structure used to divert flow) and emerges in the other basin, seemingly pristine. This water will find its way to your glass, but as of now, it’s only completed part of the journey. Even though neither basin signifies the first or last step in the process that is securing Albuquerque’s water supply, together they serve as a lovely visual metaphor: the sediment and cloudy mass of river water on one side, the purity of drinking water on the other. 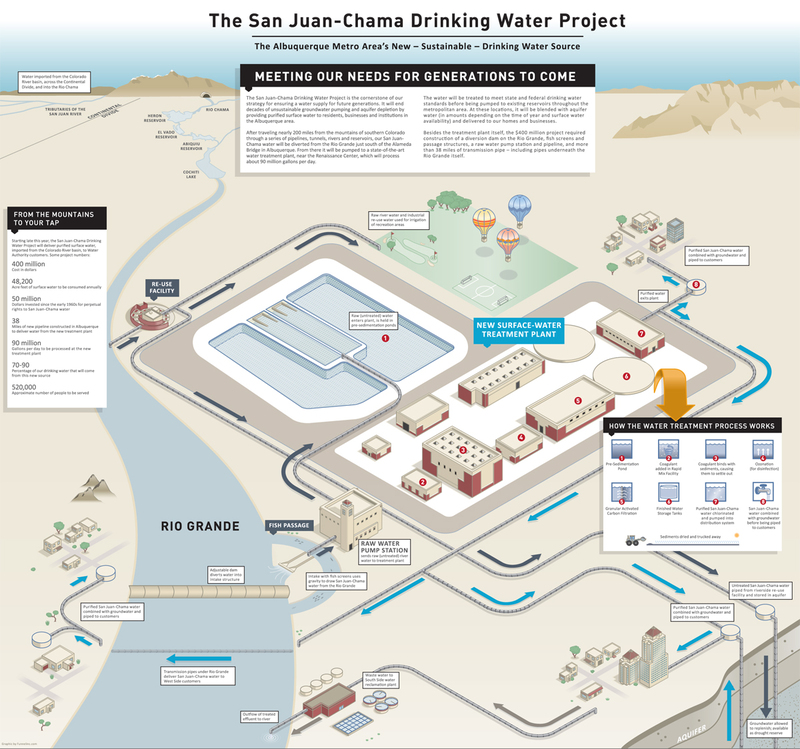 After both adamant support and vocal dissent [See: Feature, “Parched?” May 31-June 6, 2007, and Newscity, “Down River,” Sept. 18-24, 2008], the San Juan-Chama Drinking Water Project has come online. And from now on, at least some of the water dripping out of your faucet comes from the Rio Grande. It all begins on the river. John Stomp looks positively gleeful. After 11 years of shepherding the Drinking Water Project through the minefields of hundreds of permits, dozens of meetings and a court appeal, his baby is about to come to life. His gestures are sweeping as he signals upstream, turns and points to a dam, which has more than 20 moveable gates and remains partially open to allow river flow. If water levels in the river become too low, the gates will be lowered completely. Here, just south of the Alameda Bridge, millions of gallons of river water are diverted to a pump station a couple hundred yards away. Fish swept in the current are stopped by screens with holes small enough to block minnow eggs then led back to the river by a passage channel. Dozens of miles of pipeline were laid throughout Albuquerque to accommodate the new drinking water system. The morning is hazy and crisp. The trees on the banks of the Bosque stand sepia-toned. Stomp shudders momentarily in his white, button-down shirt as he explains how water is diverted. There are two intake structures, each with fish screens and a giant windshield wiper to clean those screens. An intake structure can hold 90 million gallons at a time, and so if one needs to shut down for maintenance, the other deploys. “We’re engineers, man. We like redundancy,” Stomp laughs. Some people are concerned about taking such a large amount of water from the river. Steve Harris is a co-founder of Rio Grande Restoration, as well as the original organizer for a group that filed an appeal against the Drinking Water Project in 2001 (a ruling still hasn’t been issued by the Court of Appeals). Harris and his cohorts argue that removing so much water from the river could have ecological consequences for river life. They also say New Mexico may no longer be able to meet its requirements of the Rio Grande Compact, which orders that the state pass a certain amount of water into Texas. Stomp argues the state is in no such risk since the water taken out of the river isn’t native; it’s actually Colorado water. In the early '70s, Albuquerque started diverting water from the San Juan River across the Colorado border and into the Rio Chama (making it San Juan-Chama water), which is then channeled into the Rio Grande. The water travels about 200 miles from Colorado before it reaches the city. Albuquerque gets as much as 48,200 acre-feet of that water a year (about 15.7 billion gallons). And so some Rio Grande water is taken from the river at the same time as San Juan-Chama water to create a cushion—but at the end of the line, the same amount of Rio Grande water that was taken out must be put back. Because all the water comes from Colorado, Stomp says the project will in no way interfere with New Mexico meeting the requirements of the compact. Still, Harris says the state was in noncompliance with the compact for decades before it started diverting water into the Rio Grande. Additionally, the river has evolved to become dependent on the extra water, he says, and there’s no telling what will happen when it’s removed. Albuquerque used to think its water supply was infinite, a miraculous oasis the size of Lake Superior buried in the desert. It wasn’t until the early ’90s that the city discovered it wasn’t sitting on a lake—it was hovering over a fractured network of vessels with only half as much water as previously thought. And that network is shrinking. If nothing changes in Albuquerque’s water consumption, it’s estimated that in 25 years, the city will experience severe water quality issues; in 35 years, pockets of land in the city could start to sink. The $385 million Drinking Water Project is supposed to be the answer to that conundrum—or at least a preliminary one. Through the project, residents will still drink aquifer water, but they’ll also drink river water. Stomp says in the first year, 25 percent of the city’s water will come from the river. That amount will gradually increase to meet about half the city’s demand in a couple years. He estimates that after having the project in place after 40 years, the aquifer’s levels will rise by 25 feet. Drinking river water is the city’s attempt to save the aquifer. The raw water pump station is inconspicuous—at least, as far as 15,000 square-feet industrial buildings go. After looking at several designs, neighbors settled on an old Spanish-style church façade, empty tower and all. The only exterior signs that the building is not, in fact, a house of worship are scattered lightning rods along the roof that resemble spent dandelions. Behind soundproof walls are a dozen mint-green 1,000-horsepower pumps that send river water on its way to the water treatment plant. The building, as are most of the auxiliary Drinking Water Project facilities, is controlled remotely so the city doesn’t have to hire additional workers. The water treatment plant sits on 90 acres a short distance from I-25 and Montgomery, although Stomp says the city bought 160 acres so it could be expanded eventually without bothering neighbors. The veneer of the facility was designed to mimic the Sandias in shape and palette and is painted in colors that bring to mind fruits besides watermelon: raspberry, mango, cantaloupe. A shallow moat surrounds the entrance. It will be filled with water, made into a small-scale Rio Grande and used as an educational tool. As river water is pushed through the plant, it is treated with ferric chloride and other chemicals, cleaned by carbon filtration and hit with ozone twice to strip it of any pollutants. Gravity does the rest, sending it across the city to combine with aquifer water, where it is then pumped into faucets. Stomp says the treatment process is as good as any in the country and testing occurs frequently to guarantee the water is safe to drink. But concerns have also arisen from groups who are worried about contaminants in the river. Aqua es Vida Action Team has had discussions with the Water Utility Authority on water quality for two years. It’s asked for a higher level of monitoring on the river, citing that pollutants like pharmaceuticals, antibiotics, perchlorate (an ingredient used in rocket fuel found to disrupt thyroid function), radionuclides and Bisphenol A (an endocrine disruptor) were found in the Rio Grande. The EPA sets standards for about 90 of these contaminants in all potable water, including tap and bottled drinking water. Stomp says the river is in some ways cleaner than the aquifer—it has less arsenic, less salt and less radioactive particles, for instance—and he says the treatment process should remove any troublesome contaminants that might be found. Aqua es Vida has asked that river water be tested at the parts-per-trillion level (parts-per-billion is the metric used now), but Stomp says he’s not sure such technology exists. “Now that the project’s up and running, we’re conducting an experiment to see what results we have,” says Rio Grande Restoration’s Harris. “It’s an experiment on the landscape.” Harris says whatever the effect on that landscape, it won’t be seen for several years. He argues that the city doesn’t have a backup plan if the Drinking Water Project causes problems. No one knows if the project will fix the city’s water problems, but Stomp hopes it will. On Friday, Dec. 5, around 3 p.m., the switch was flipped.